Kids can build their own robot with Jet and his friends! Explore the solar system with “Ready, Jet, Go!” and enjoy learning games that teach science, engineering and problem-solving skills. 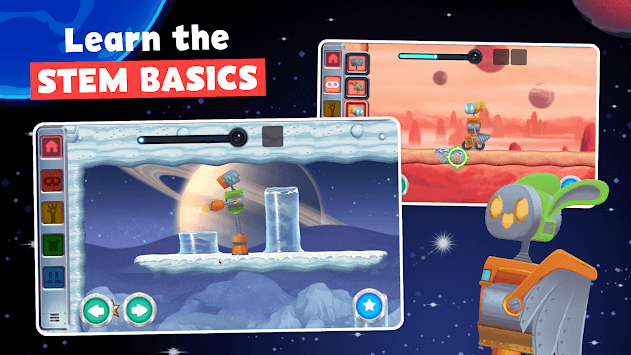 Design and build a robot and travel through space with Jet and friends. Build new parts to help you get through obstacles as you go from Earth to the moon to Mars and beyond. Each planet has a new challenge for your robot. Kids can build new parts and swap them around to find the best way to solve each level, learning critical thinking and problem-solving skills as they do. Jet’s Bot Builder adapts to your young learner’s progress. Children will learn STEM concepts at their own pace while they have fun building and designing robots. 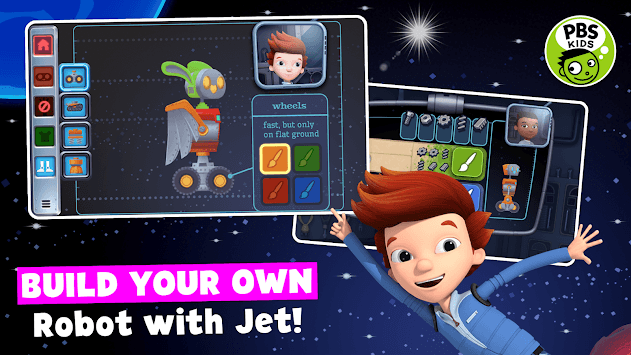 Create, explore, learn and have fun building a robot with Jet and friends in Jet’s Bot Builder – download now! Help your child explore the universe and learn the basics of engineering with the beloved “Ready, Jet, Go!” characters. Download Jet’s Bot Builder and let your child start creating! The Jet’s Bot Builder app is based on the PBS KIDS series Ready, Jet, Go! produced by Wind Dancer and designed to extend the series’ STEM curriculum. For more learning adventures with Ready, Jet, Go! visit: http://www.pbskids.org/readyjetgo. The Jet’s Bot Builder app is part of PBS KIDS’ ongoing commitment to helping kids build the skills they need to succeed in school and in life. PBS KIDS, the number one educational media brand for kids, offers all children the opportunity to explore new ideas and new worlds through television and digital media, as well as community-based programs. Jet’s Bot Builder app was created as part of the Corporation for Public Broadcasting (CPB) and PBS Ready To Learn Initiative with funding from the U.S Department of Education. The contents of the app were developed under a cooperative agreement #U295A150003, from the Department of Education. However, these contents do not necessarily represent the policy of the Department of Education, and you should not assume endorsement by the Federal Government. Build your own robot with Jet and friends. 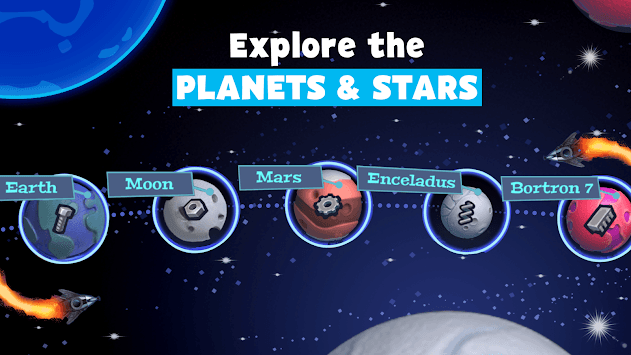 Explore space with your robot and travel from Mars to the stars & beyond with learning games that teach science & engineering.